Sridhar Goli, MD, is a board-certified pediatrician and pediatric gastroenterologist who specializes in the diagnosis and treatment of complex digestive and nutritional disorders in children. An expert diagnostician and clinician, Dr. Goli is known for his compassionate bedside manner when treating children with gastrointestinal, liver, pancreatic, and nutritional disorders. His areas of focus include upper endoscopy, colonoscopy, capsule endoscopy, PEG tube placement, polypectomy, variceal banding and management of inflammatory bowel disease and other chronic digestive issues in kids. 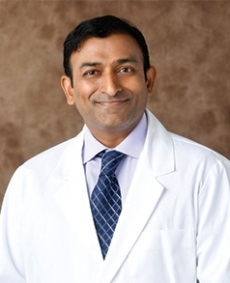 Dr. Goli attended Syracuse University as an undergraduate before moving to India to receive his medical degree from Mahadevappa Rampure Medical College. He completed his residency at Saint Peter's University Hospital in New Jersey, following up with fellowship training in pediatric gastroenterology at the State University of New York in Brooklyn.